At Auto Classica Storage Ltd we understand that circumstances often dictate whether you can get you car to us easily or not. Which is why with our ‘Collection and Drop off’ classic car transport services we can arrange to collect or deliver your vehicle from and to anywhere in mainland UK or Europe with the minimum of fuss. To discuss your particular classic car transport service requirement in more detail please call 0800 0096 911 or get a quote using the form below. Please share a little detail about your vehicle collection so we can tailor a quotation that's right for you. 1. What type of vehicle do you wish to have collected? 1. What type of transport do you require? 3. Please provide the collection address postcode. We can collect or deliver your clasic or sport car from anywhere in mainland UK or Europe. Either at the start of your cars storage with us or at the end of the storage term, we can arrange for our professional transporter drivers to collect or deliver your vehicle. As with all our services, collection and transport of vehicles for our classic car storage service is available to your personal requirements. 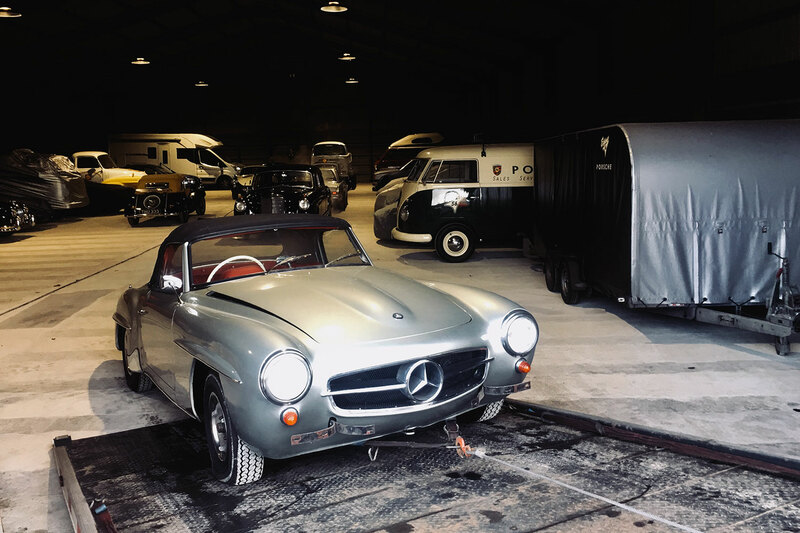 We will go through our handover and induction process with you and safely deliver your classic car, sports car, camper van or motorcyle back to our facility from anywhere in the UK or Europe. Prices for all transport services are available on request – please do contact us to discuss your classic car storage and transportation requirements. We can also arrange your own personal pick up or drop off to major UK Airports including Luton, Heathrow, Gatwick and Stanstead. Please get in touch for a quote and to arrange. If you are planning to be away for long period of 12 months or more enquire about our aftercare services. We can Service and MOT your car while you’re away keeping your vehicle and it’s history up to date. To discuss your Classic Car Storage needs or to arrange an appointment please fill out the form opposite. All visits are strictly by appointment only. Thank you. For the purposes of security we do not publicly display our storage address. Copyright © 2019 Auto Classica Storage Ltd, all rights reserved. All Photography shot and owned by Auto Classica Storage Ltd.